“We want to know what others know about us and our country” -An amazing project with women selfhelp groups in India – Go India, go future! 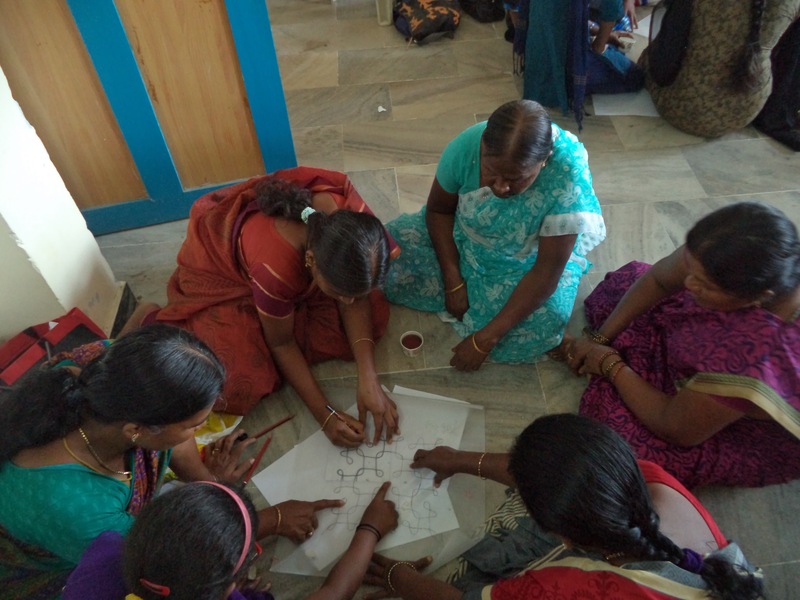 A few weeks ago I visited the women selfhelp groups in Karamadai in Tamil Nadu, India and asked them whether they would be interested in tailoring a game. A local NGO helped to organize and ca 30 women from poor urban background joined the meeting. They all were very keen to know more details about this project. When I mentioned the “Things you should know about India”- cards, one of the women interrupted me and asked:”Ma’m, can you ask me one of the questions on the cards, please?” I was surprised but I asked her how many official languages do exist in India? The other women in the room started to discuss,too and within a moment I got several answers…and started to play more cards about geography, culture, history, but also celebrities and daily life in India . We had a lot of fun all together. A sentence that still stays in my mind and heart. Today, I have received the first pictures from the tailoring training. Within three days ca. 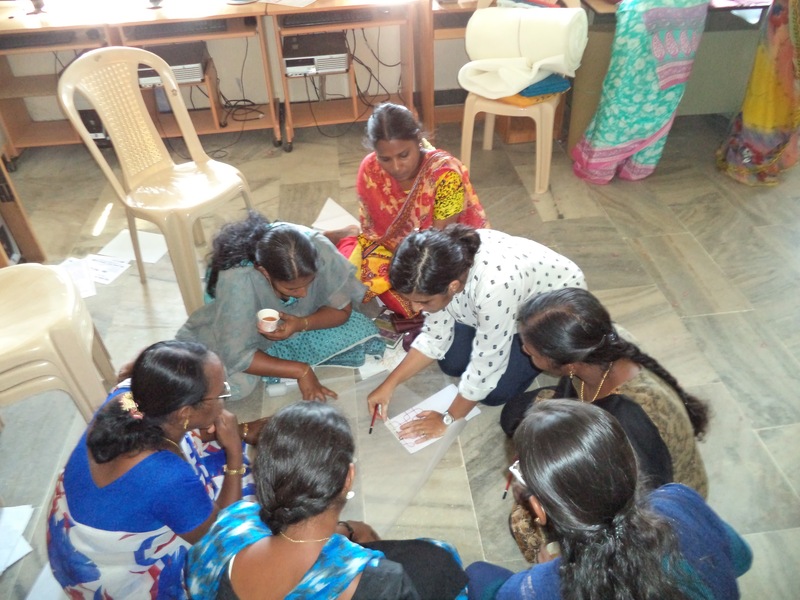 thirty women learn how to tailor the game board which at the same time is also the game bag. The game will be done in many colours, but all of them show a huge rangoli at its center. Rangoli design is a safe, beautiful and expressive tool that can bring people together to work towards a common creative goal, transcending age, language or cultural barriers. It summarizes what this game is all about: it’s about us, about our world. After the training the women will start to work on the game boards. They will do it in their home villages in small groups, in a way that all can participate and benefit. By end of August the first 100 games will be ready. I look really forward to visiting them. It will be the starting point to bring the game into the world. And what about the perfectly tailored gameboard? I believe in these women. They are organized in the groups for several years now and have learned that much. They have good basic tailoring skills, too. And they have a passion forwhat they do. Maybe the game production will not be perfect, maybe we need more time to get the first hundred pieces together, maybe there are some challenges coming up in the next weeks which we need to solve. 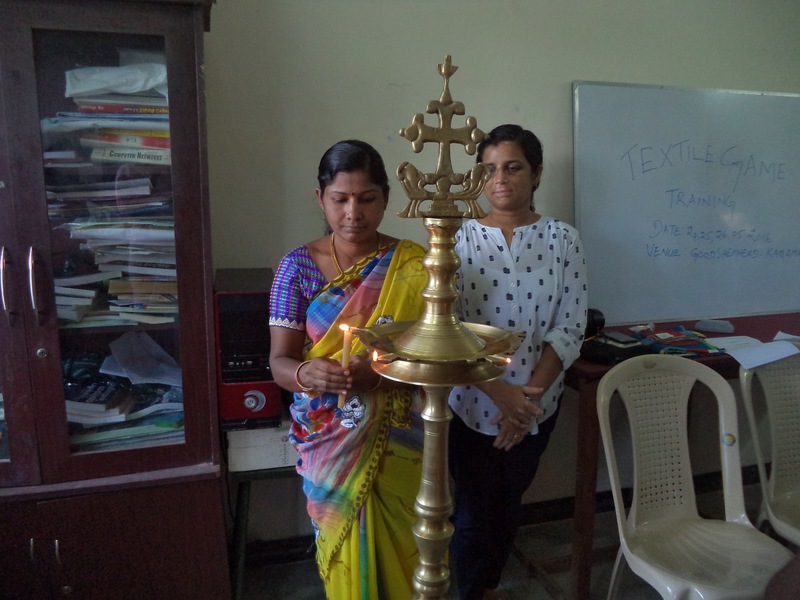 But we have our local sisters from the NGO, who will help wherever needed and the nice designer lady of the game of Ahmedabad who is also training them. And I’m sure they have all the energy and passion needed. And me? My task is to finish the card development now and to bring them their own card sets with questions about India. Then to develop also the other card sets based on some workshops with the kindergarten teachers that took place already and to meet with other target groups we want to use the game for. When I go back to Karamadai I’m sure that we will play together again. The women from the villages and poor urban surroundings, the children, me and whoever will join us. Maybe you?